Below are my very first music reviews written in 2001. I recently found them and wanted to share them because these are both great albums. It has been written “songs are happy when Shirley sings them” and that is certainly true on You’re My Thrill. Over eight years ago, jazz pianist/vocalist Shirley Horn and producer/composer Johnny Mandel joined forces on the award-winning album, Here’s To Life, which has become a jazz standard. This wonderful tradition has continued in their pairing on this recording. Included on this set are “The Best Is Yet to Come“, “The Very Thought of You“, “I Got Lost In His Arms” and “You?d Better Love Me (While You May)”. The highlights of this album are the lush title track, “You?re My Thrill” and the romantic “My Heart Stood Still” which rises and swells into a wonderful climax where time literally stands still. In the tradition of Here?s To Life, Shirley and her trio laid down the tracks in advance on all but one of the songs. Johnny created lush orchestrations, which harmonically fill, embellish, and caress each of the songs. Shirley?s vocals are economical yet effective on the ballads and she really swings on the mid-tempos numbers. You’re My Thrill shall truly be a thrill to your heart. On the heels of her Grammy Award Winning Album, In The Moment/Live In Concert, jazz vocalist Dianne Reeves presents, The Calling Celebrating Sarah Vaughan, a musically moving tribute to her mentor, “The Divine One“, Sarah Vaughan. Backed by a 42-piece orchestra, Dianne takes us on a musical journey than spans over the vast body of Sarah’s music. She has chosen songs that capture Sarah’s musical versatility and Dianne breathes her own unique African, Caribbean and Brazilian rhythms into every note. Included are beautiful renditions of Sarah standards, “Send In The Clowns“, “Embraceable You“, “Fascinating Rhythm“, “Speak Low” and a bluesy, playful “I Hadn’t Anyone ‘Til You” featuring Clark Terry on ad-lib vocals and trumpet solo. “I Remember Sarah” pays tribute to Sassy’s bluesy scatting and “A Chamada” (The Call) homage to the special voice inside of each of us. Pianist/Composer Billy Childs provided the orchestral arrangements and producer/arranger/musician George Duke presided over the production of these timeless treasures. Whether for a long drive or a quiet evening alone, you are sure to hear the calling inside your soul. This entry was posted on Wednesday, July 30th, 2003 at 12:26 am. 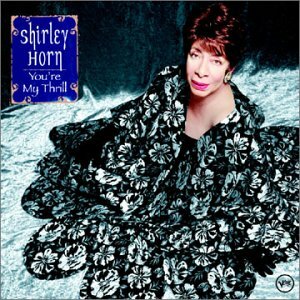 It is filed under Music Reviews, Shirley Horn and tagged with Dianne Reeves, jazz, Shirley Horn, The Calling, vocals, You're My Thrill. You can follow any responses to this entry through the RSS 2.0 feed. 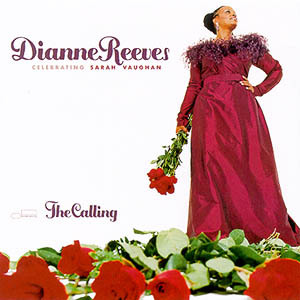 james, this review of Dianne Reeves, THE CALLING is excellent. i bought this cd and never listened to it and then one day i was looking through my collection for a cd to love and popped it in. can you believe over a year later i still listen to this cd every day. i can even listen to it in the gym, when i usually need something with a little more bounce. dianne is at her best on this cd. superb!